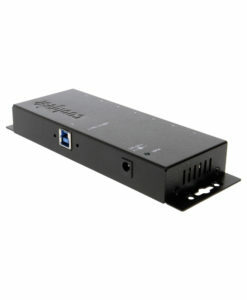 The USBG-7DU2 7-Port USB 2.0 Hub provides unique features to work in the bus-powered mode without an external AC power adapter, also features an external 2-pin Terminal Block Connector for self-powered mode. 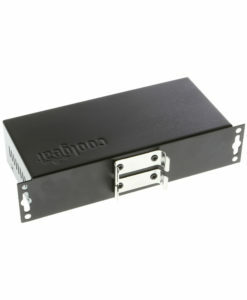 Includes DIN-Rail Mounting kit for DIN-Rail applications. The Metal USBG-7DU2 7-Port USB 2.0 Hub is very convenient for light power consumption USB devices and is DIN-Rail Mounting. This product provides a unique feature to work in the bus-powered mode without an external AC power adapter. If you need more power on the 7 downstream ports, This 7-Port USB 2.0 Hub also features an external 2-pin Terminal Block Connector for self-powered mode. Since USB connections are the most popular external port for modern devices to connect to PCs, the USBG-7DU2 provides an ideal solution to expand your USB peripherals immediately and save your investment. The USBG-7DU2 is a USB Hub that complies with the Universal Serial Bus (USB) Specifications Revision 2.0 and can work up to 480Mbps. 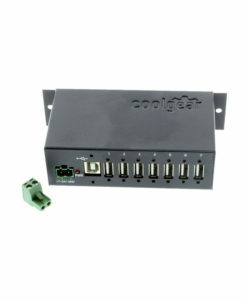 This 7-Port USB 2.0 Hub provides 7 downstream facing ports with standard A-type USB 2.0 connectors. With NEC uPD720113 USB 2.0 controller, it is backward compatible with USB 1.0 and 1.1. and It provides an out of the box industry standard that allows connection of up to seven USB peripherals or devices to your USB ready PC or Mac. Supports keyboard, mouse, monitor, scanner, printer, PC Camera, telephone, CD-ROM drive, joystick, virtual reality helmet, modem, PBX and many more USB devices. Supports 7 external USB 2.0 Type-A connectors and 1 Type-B Upstream connector. The 7 port USB 2.0 USB Hub has certain accessories that work with it. These accessories are what you can order if needed. Did you misplace or break a part that came with your hub? Purchase it here!